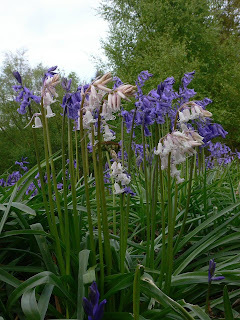 A very belated post but the Banstead Botany Blog could not let spring go by without mention of the Bluebells in Banstead Woods. Bluebell woods are quintessentially British, the plant itself (Endymion non-scriptus) is native to a small part of maritime Europe but only in the British Isles does it reach such levels of monoculture that is typical of our springtime landscape. In the east it is very much a woodland plant but in the far west it often grows in more open situations. 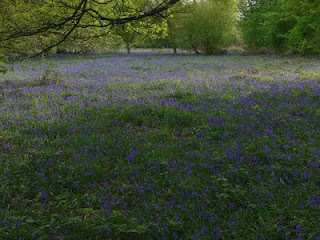 Banstead Woods is well known for its annual display and this year was particularly good. However this may not have continued to be so because until recently the display was under threat. The reason was Rhododendron ponticum that up until about 15 years ago was taking over the understorey of the Woods with about a quarter of the total area covered. However a concerted programme of annual “Rhododendron Bashing” organised by Reigate and Banstead Council (who own the Woods) and a local conservation group (the DCMP) has had a dramatic effect. Not only is the woodland floor now more open and hence views extend further but slowly the Bluebells are recolonising the cleared areas to increase the expanse of blue. The display and scent early on a spring morning is rather special. A few years back someone suggested to me that the Bluebell display in this country owes its existence to the extinction of Wild Boar (that are partial to bluebells) in medieval times and that their reintroduction would lead to the disappearance of Bluebell woods. I don’t know if that is true, luckily as far as I am aware there are no wild boar around here! Being me I had to include a close up of a flower, not just blue but also white! It seems to me that white variants suffer a distinct competitive disadvantage, they do not seem to clump up very often remaining as single spikes and certainly do not appear in the same place each year. Bluebells 1, Rhodendron ponticum 0. Those are lovely photos, John - glad I clicked on 'em. Our woodland flora is something special. Sorry I can't spell Rhododendron!